I know the norm would want me to write this section in the third person but that’s just way too weird (even for me). 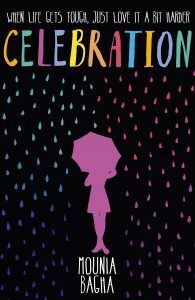 My name is Mounia Bagha and I am the author of Celebration published in December 2015 and of its French version Nos Jours de Fêtes published in December 2017. I have also published articles in various online publications that you can check out in the Writing section. I like to write about people you could meet in real life and that are involved in the kind of situation you could understand and I absolutely love to empathise with my characters especially when they involve in self-sabotage, probably because it reminds me of (a lot of) people I know. I also create mini videos all revolving around the themes (in no particular order) of love, friendship, family, heartaches and expectations … Well, basically about life and all the WTF in-between that have inspired Celebration. And if you’d like to receive my newsletter on all the topics above and more, don’t forget to subscribe below.